Campaign objects have been moved from the floating toolbar to a static sidebar on the left side of the campaign canvas . Just like in our newest Email Builder, use a simple, modern left-hand toolbar as you build automation. Each campaign object now has its own icon. The new sidebar will be available in the campaign canvas and when working on a campaign sequence . Edit and Reporting views in the Campaign Builder are now located on the right side of the top toolbar. Previously, these were tabs at the top of the campaign canvas labeled, “Edit” and “Performance”. You can now automate emails and tasks based on how your customers respond to their quote. There is a new Quote goal in the Campaign Builder that will allow you to run campaign automation based on quote events. A Purchase Goal (set as an entry point) can also be triggered IF the quote being paid online includes the same product as the purchase goal (specific or any product.) This means two goals could be triggered, so be aware of all automation tied to Purchase and Quote Goals. The charge now setting on a manual order will not trigger when a quote is paid online. Several new currency locales are now supported in Infusionsoft. Currency Locale controls the currency symbol displayed on products in the shopping cart, order forms, and invoices. This setting can be set as your local currency by going to E-Commerce > E-Commerce Settings > Orders > Under Billing. Currency locale options are ordered alphabetically in the list. The local time and Time Zone can now be viewed when looking at a list of contacts in Interactive View. Now, you can view a contact’s local time without having to open the contact record. You can also edit this information on-the-fly while in Interactive View. Contacts with a Billing Zip/Postal Code (US) and with a Time Zone will display the time based on the Billing Zip/Postal Code. Contacts with a Billing Zip/Postal Code (US) and without a Time Zone will display the time based on the Billing Zip/Postal Code. Contacts without a Billing Zip/Postal Code (US) and with a Time Zone will display the time based on the Timezone. Contacts without a Billing Zip/Postal Code (US) and without Time Zone will not display local time or time zone. Additional text area – this is a block of text that might be used for legal disclaimers or similar. Link text – Customize the link text for the unsubscribe link. Please note that this link is required. The Email Builder Beta now has a signature block that can be used to add a user signature to emails being sent out. 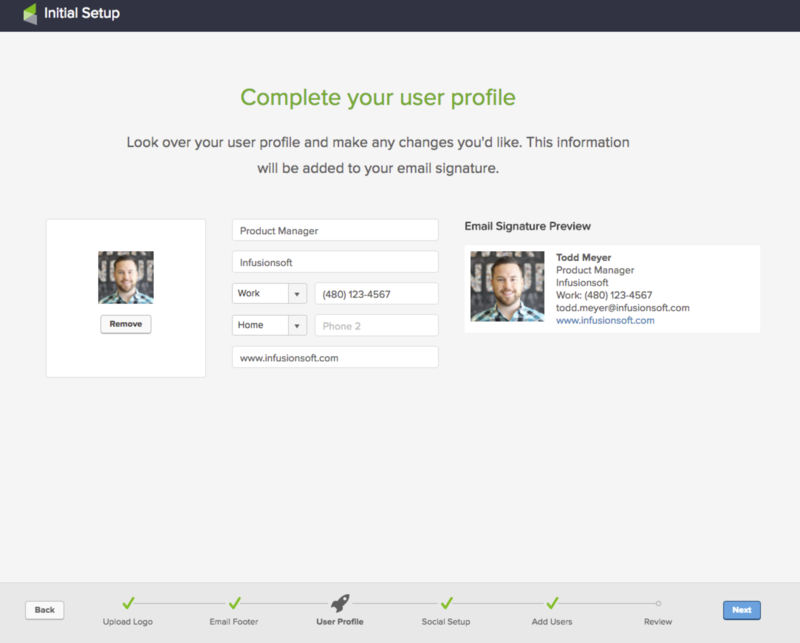 Note for existing users, the signature used in the Email Builder Beta is automatically generated based on information stored on the user profile, it does not use the signature previously used by the old email builder. 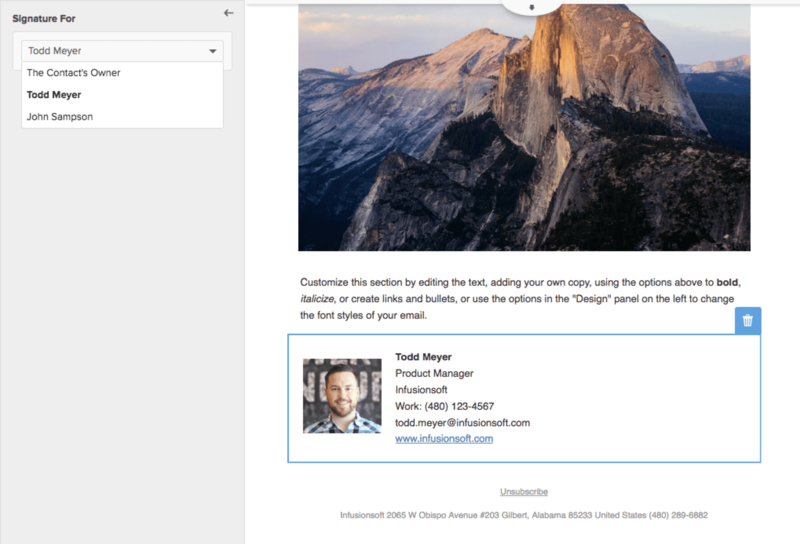 New Block Available in Email Builder beta – the Signature block is now available for use in the Email Builder beta. Specific users can be selected, or, the Contact’s Owner can be selected which will automatically merge in the signature of the owner of the contact. Currently, when previewing an email with a Signature block, the merge code displays in place of the signature. This issue will be resolved shortly. For existing applications, the old signature can still be edited on the Signature ( Legacy ) tab on the user record. 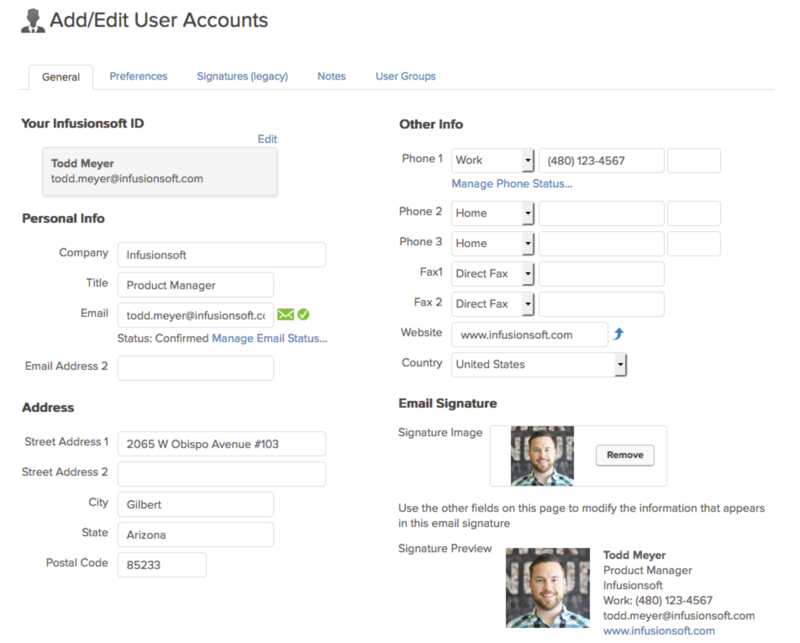 This legacy signature will continue to be used in the old email builders. Infusionsoft’s release process is intentionally designed to deliver our latest innovations and improvements while minimizing disruption to daily operations of the small businesses who use Infusionsoft all around the globe. As with any cloud service update, there is the possibility of intermittent slowness as software updates are deployed to all accounts. Given this possibility, Infusionsoft policy is to only release updates outside typical business hours. All accounts in the Americas, European and African regions are slated for release in the evening/early morning hours local time. All Asia & Pacific region accounts are updated on a separate schedule so that these deployments occur overnight local time for users in this region.